Aker Yard has changed its name to STX Europe, effective November 3, 2008. The move reflects the fact that South Korea-based STX Business Group has become principal shareholder. Aker Yard Cabins is now STX Europe Cabins. Did you know that the cabin on your next (or last) cruise is a prefab? That in all likelihood, your cruise ship cabin was completely designed and built off-site -- and then trucked, intact, to a shipyard where it was slotted into place as if a piece of a jigsaw puzzle? If you book staterooms that range from insides to promenade views (Royal Caribbean) to standards balconies, it probably was. Indeed, on a visit to Finland's Aker Yards Cabins, Cruise Critic's Carolyn Spencer Brown watched the process unfold. In the tiny town of Piikkio, nestled in farm country some 20 kilometers from the shipbuilding city of Turku, Aker Yards Cabins has been building pre-designed cruise cabins for 20 years. Here, panels are assembled to make walls and ceilings. Toilets are installed and shower floors, made of hard plastic and designed to resemble colorful mosaic combinations, have been pre-made and are ready to be laid in bathrooms. Entire technical systems -- each cabin has its own -- are put in place. Telephones, mini-bars and even electric sockets (providing access to European and American currents), along with data ports, are all snugly outfitted into a vanity desk/wall unit that's arrived from a furniture factory elsewhere in Finland. Even the beds hang tightly from the walls. If you've ever cruised on Royal Caribbean's Radiance-, Voyager- or Freedom-class ships in anything but a huge suite, you've stayed in one of these prefabs. Same goes for a variety of other vessels, such as Costa Atlantica and Costa Mediterranea, Carnival's Spirit class (which also includes Carnival Legend, Carnival Pride and Carnival Miracle), and cruise ferries like Tallink's Galaxy and Color Line's Fantasy. Most recently, the company consulted on cabin designs for Celebrity's innovative Solstice-class ships -- and is working on prototypes for Royal Caribbean's revolutionary Genesis class. Down the road in Turku, Royal Caribbean's Liberty of the Seas may be undergoing finishing touches, a mere two months from delivery, but that ship is old news now. Those cabins were delivered eons ago -- each one about the size of a small car, two to a truck's trailer, averaging some 20 - 30 truckloads per week. They're already in place onboard. Instead, these are intended for Royal Caribbean's Independence of the Seas, the third of the Freedom-class ships, which at the time of this writing is little more than a hull and a few pieces of deck in Aker Yards' dry dock. At this point, 150 cabins are constructed each week, and stored here, in a yard beyond the production facility, until the ship is ready for them. One of the first calls made after a cruise line signs a shipyard contract to build a new vessel is, at least nowadays, to places like this one. Whether cruising on one of Europe's elaborate ferries or on one of the biggest ships ever, cabins are an integral component. The process takes two - three days per cabin from start -- assembling walls and ceilings -- to finish -- fully installing electrical and plumbing systems (and a myriad of tasks in between). All that's needed, once they're shipped from here to the yard, is to be hauled up to the proper deck by a crane, then anchored in designated place to the ship's steel deck. After that, a coat of cement is laid down, it's topped by carpet, and window or balcony is installed. Ultimately, it will build staterooms not only for passengers but also for crew members on Independence of the Seas (same as Freedom and Liberty); suites, such as the Royal and the Presidential, are actually crafted on site (they're too big, logistically, to be transported from factory to ship). "The process is a very interesting combination of logistics and coordinates," Risto Vuorinen says dryly, as he guides us through the factory. Consider that the firm not only builds the free-standing boxes but also liaises with cruise lines and their architects -- not to mention working with some 100 suppliers, who elsewhere construct everything from bed frames to plumbing systems. It's an intriguing feat. Aker Yards Cabins, which until 2007's name change was long known as Piikkio Works, pioneered the concept of pre-fabs and, indeed, owned a patent for the systems for a decade. The patent's now expired and other factories have cropped up, using the technology Piikkio invented -- but from our look at the place, the company is too busy to worry too much about competition. Upon receiving a request for designs, factory workers construct sample cabins. They're located on site, where you can, almost eerily, walk down a short corridor that exactly replicates an onboard scenario. These staterooms are completely furnished (all the better to give cruise line executives and architects a clear sense of how the design will work in the space) -- and that includes outfitting of bedspreads and pillows, curtains, flat-screen televisions, and bathrooms in which towels hang just so. They're so real you could lie down and take a nap in one of 'em -- and, yes, the plumbing and electric all work, so a shower wouldn't be out of reach either. The ones we see today, a series of three different categories (outside, promenade and inside) have been made for Color Line's new Magic. Just a few weeks ago, proposed staterooms for Celebrity's Solstice-class ships were lined up here, too (they've since been shipped to Germany's Meyer Werft, where those vessels are being built). In another part of the building -- away from prying eyes, alas -- is the fourth or fifth cabin setup of the design intended for Royal Caribbean's Genesis class. Indeed, company presidents like Royal Caribbean's Adam Goldstein and Celebrity Cruises' Dan Hanrahan most recently made the trek during Finland's deepest, darkest winter to this place, to offer feedback; they'll ultimately sign-off on the final design. Goldstein tells us he's made the trip to Piikkio four or more times already to check out different versions. The factory is an unprepossessing place -- it's a series of low-slung warehouse-like buildings, each housing a specific function. Some 300 people, a combination of production line workers and design, logistics and sales executives, are spread about. Upon design approval, the real beginning is in the panel manufacturing warehouse. This is where wall and ceiling components are fire and sound tested (requiring special glues and certain screws, among other materials). Nothing can even proceed until these panels are tested by officials from Lloyd's Register and Norska Veritas -- two of the leading companies in the world that certify that ships achieve safety standards. "Without that certification," Risto Vuorinen, Aker Cabin's manager of sales and products says, "we can't build." Generally, because so many cruise lines have nearly (if not entirely) identical ships within various classes, the certification issue is more onerous for "prototypes" -- and the Genesis-class cabins will fit into that category. Those for Independence of the Seas, which are the same as its Freedom and Liberty counterparts, aren't such a challenge. That step was completed with Freedom of the Seas, the first in the Freedom-class. Once approved? The panels, in a handful of pieces, are organized into individual cabin segments, taped up securely, and put aside until they're needed. In a warehouse across the snow-packed parking lot, hundreds of vanity units, which have been identically made by two different Finnish furniture makers, are lined up, side by side, and protected with plastic wrap. 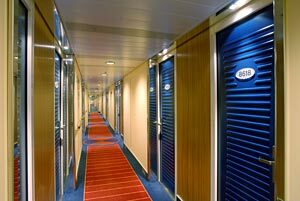 Anyone who's cruised on a fairly contemporary Royal Caribbean ship will recognize these wall units in a heartbeat! In this area, where logistics and purchasing staffers keep track of the merchandise that comes from some 100 different suppliers, the atmosphere evokes a trip to Home Depot. Toilets (Evac 900 models, if you want to know), still in their boxes, are stacked in clusters. There's a whole group of ventilation units, piles of bed frames, cartons of toilet brushes (really! ), and even a whole batch of Ving Card containers -- you know, the manufacturer of your cabin's key card. We told you: This is a turnkey kind of place. Seven days before the materials are needed, they're culled from various rows of merchandise and sent over to the assembly plant, just a few hundred feet away. The assembly plant, designed like a car factory in which lines, 13 in all, focus on specific types of cabins at any given time, depending on the schedule, is the heart of this place: It's busy, loud and colorful. 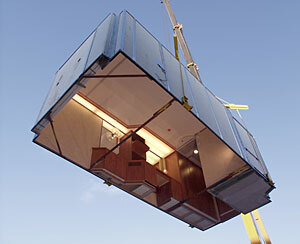 It takes two to three days to fully assemble one cabin (and, as mentioned, the factory can complete up to 150 per week). Cabin size capability tops out at 30 square meters -- anything bigger than that is too unwieldy to be transported by truck. Each of the 13 different lines specializes in a particular cabin style. Insides, for instance, require different outfittings (such as the big oval mirror that hangs over the bed to replicate a window). Spaces for windows come in different shapes and sizes; a balcony cabin will have nearly one full wall open to the elements. Otherwise, they're all built the same. It's a lot like playing with Legos. Workers start with wall and ceiling panels which, as noted, have already been assembled into pieces (and safety tested); these pallets are unwrapped and the pieces are fastened together. Next step: All elements of the cabin itself are actually hinged to various walls. There's no floor aside from a temporary support (the real floor is part of the ship's steel decking); neither are windows or balcony units installed here (though cutouts are in place). A metal liner wraps around the bottom (check it out, next time you're onboard), and this ultimately is welded to the ship's steel deck. Independence of the Seas' cabin number 8594 is a work in progress today. The walls are in place, a ventilation unit is affixed through the ceiling, bedside lamps (with plastic covers to protect their white lampshades) are mounted on either side of the wire frame. Paintings are hung! The mini-fridge is just now being tucked into its designated corner in the vanity unit. The various pieces comprising the bathroom -- that Evac 900 toilet, a pre-made mosaic-like shower floor and its curved doors, and the sink and vanity -- have also been slotted into place (the bathroom, which is built on a raised platform about two inches high, actually does have a floor). All that it needs now is the installation of its plumbing and electrical system. All cabins have a nook carved into the exterior, facing the hallway (its inaccessible to passengers) that houses these key functions; they'll be plug-in-ready when 8594 leaves Piikkio. Once a series of cabins on a line are completed, they're picked up by forklift and transferred to a Saran wrap-like station, where they're bundled in protective plastic and stored outside. Outside in the snow, we can see #8576 waiting just outside; it will be trekked a few hundred feet to a big yard, where, in organized lines, cabins await the call from the mother ship.